If you have ever been to Target and walk by their display of trading cards by the check out section than you're familar with Excell Brands. They're the distributors for all those great trading cards including Topps, Pokemon, and Magic the Gathering and more. 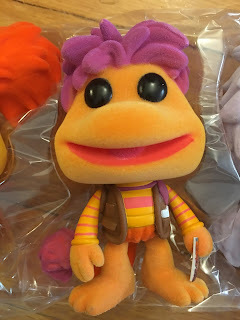 But at Toy Fair we got to see more of what they offered and we were impressed. 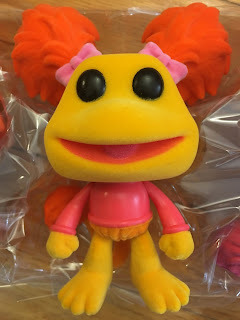 From confectionery toys (Radz) to collectibles (Animal Jam - Bulls i Toy) to games that challenges (Cub3D - Bulls i Toy); Excell offers a bit of everything. 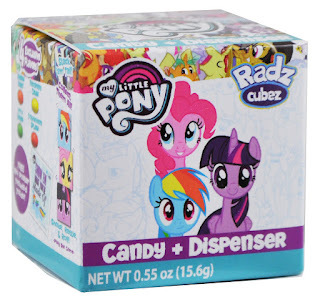 What impressed me the most in their confectionery line was the popular licenses they were able to obtain including some of the hottest franchises such as Friday Nights at Freddy's to My Little Pony, Shopkins and even DC Comics. The entirety of their offerings can also be found conveniently at Target as well. The price points for each are reasonable with most items $5.00 and below. If there's one thing that was big at New York Toy Fair this year it was every toy company had some kind of STEM or STEAM offering. With Galaxy Goo you literally get to hold the galaxy in the palm of your hands in all its goo-iness. The product should be out now and retails for only $4.99. And yes, Pluto, sorry, you're not a part of it. Besides Galaxy Goo they also have Cub3D and Skele-tube. Incredibly simple items but yet challenging and stimulating at the same time all at a reasonable price point. On their collectible side we have their new line of Animal Jam products. For ages 5+, they're not only collectible and cute but there are a wide variety of ways to play with them including several mini games online. In addition there are mini tins to decorate your den as well as Chibi Blocks animals to build (Think Nano blocks). Best of all they're all also retails for $5.00 and under! Most of the products are already out. With a few exceptions like the Radz for DC Comics and WWE which is out later this year. 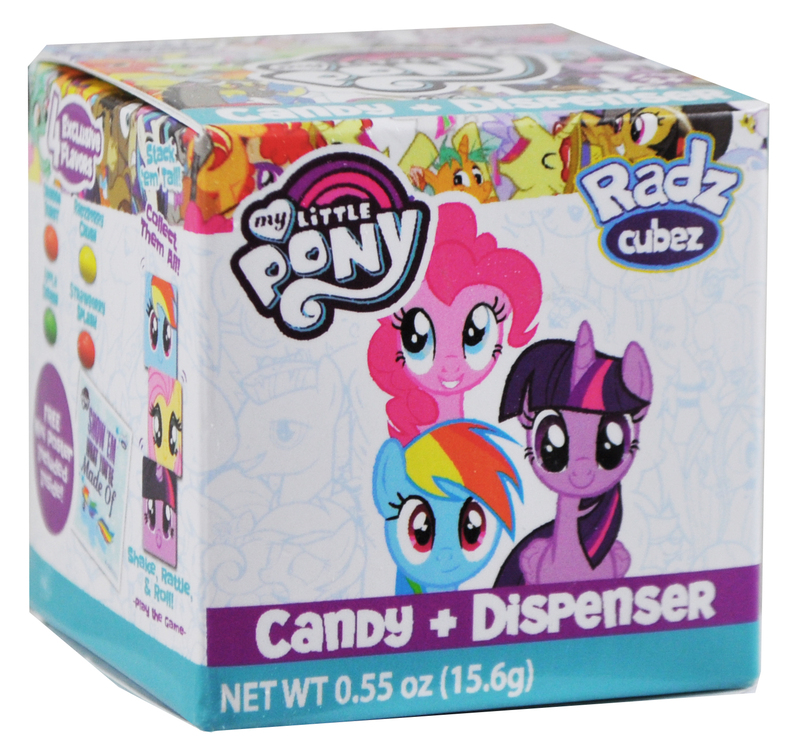 What's cool about their Radz line of various products is not only do you get to feed your sweet tooth, they're also in collectible packaging! So on your next visit to Target, make sure to check out these cool products especially if you have a young daughter ages 5 - 10 which seems to be more of their targeted age group. Though of course there's always the trading cards for us bigger kids. Some additional pictures of their products from their booth! Tell us below which you are most excited about! Review by Cynthia M; Photos by Stephen M.
We are a bit behind on this review which we first saw at Toy Fair 2017. Growing up, playing Mario Kart on the Game Cube, we were delighted to see K'Nex a leader in building sets add this license to their line up of building sets. 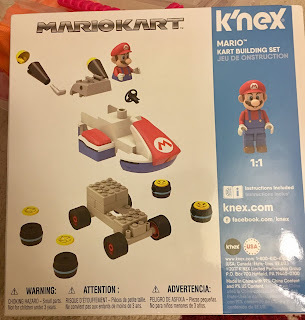 If your child has never tried a K'Nex set, they are well built and with differing levels of challenges. This particular set is targeted for ages 6-9 which I feel is quite appropriate for this age group. Some 6-7 year olds may need some assistance. The detailed picture manual does a great job in explaining the building process for this set. 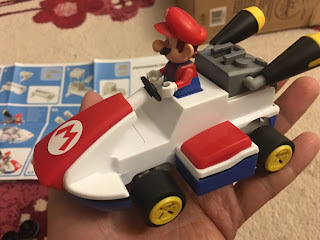 We are reviewing the set for Mario, but other characters are available including Yoshi, Princess Peach, Luigi, Donkey Kong, Wario, and Shy Guy! This is the front and the back of the packaging. 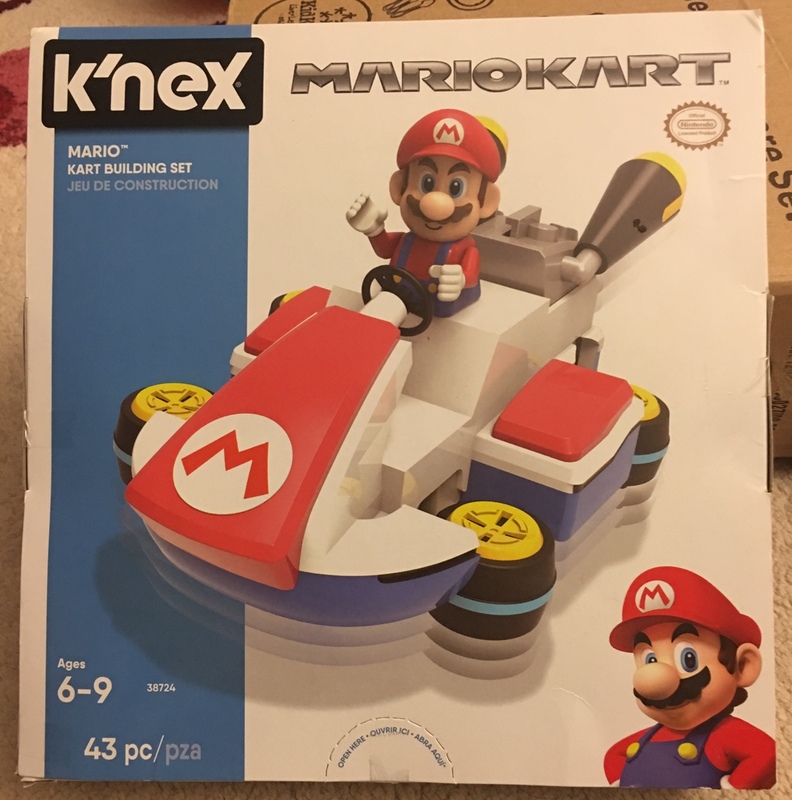 It retails for $14.99 on K'Nex, which is probably the best price you can find. On Amazon they're actually selling for $39.99 now! 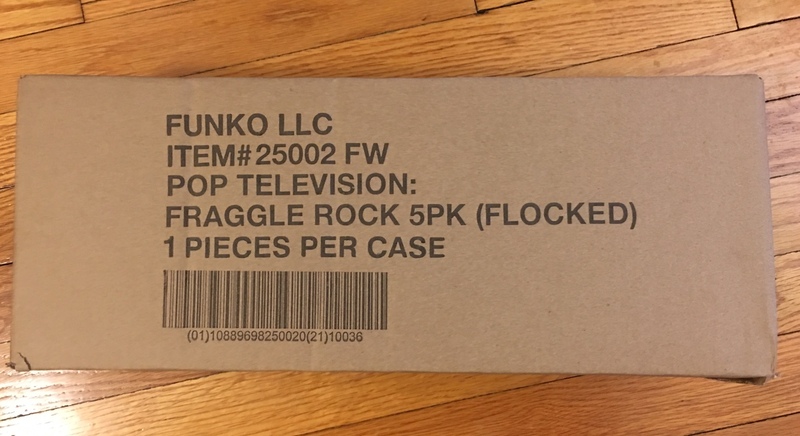 So this is what you start off with when opening the package. Instructions, a bag of building parts, Mario figure and as well two stickers that will go on the vehicle. Simple enough, right? As an adult it took approximately 5 minutes. The most difficult part was probably getting the lower chasis to stick to the body frame of the vehicle as well as the tires. Even then those two areas were not too hard. Mario also took a little of coaxing to get his legs into the car, but that was about it. There's two modes to build which is just swapping the tires for hover mode. All together, the set was fun to build, and well made. Reasonable pricing point of $8.99 - $14.99 a set. 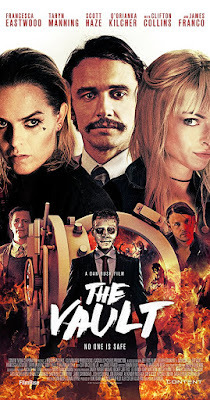 I would definitely recommend this for fans of Mario in the age group of 6-9.
Review by Stephen M.; Edited by Cynthia M.
Ghost House starring Scout Taylor-Compton (Halloween (2007)) and James Landry Hebert (Stranger Things 2, Westworld) as a couple on vacation in Thailand. 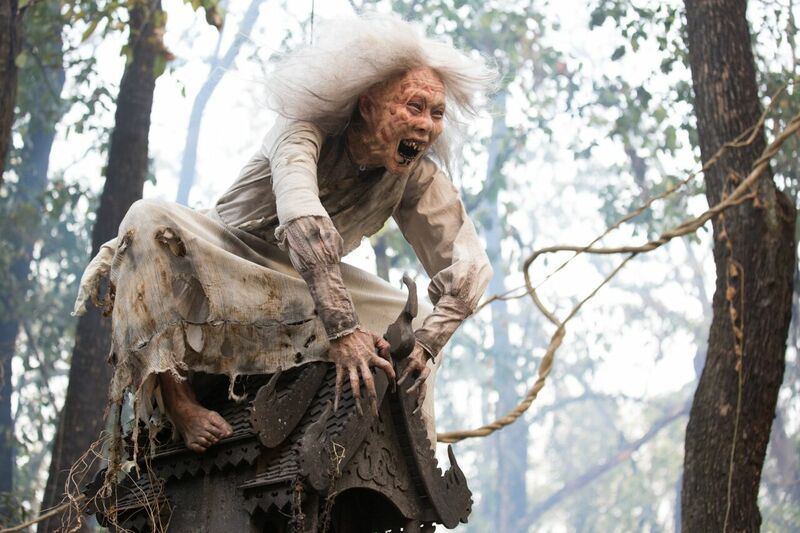 In Thailand, Scout's character Julie becomes fascinated with taking photography of ghost houses, miniature houses which are thought to house the spirits of the dead so that they do not come bother the living. But of course this wouldn't be a horror film if something didn't go wrong with the lovely couple, when one particular angry spirit attaches itself to Julie..
As a horror film, the film was a decent watch but by no stretch phenomenal. Both leads fail to carry a screen presence required for their face time with the audience. The scares were good with great costumes and make up for the watabe (angry spirit) that rivals Japanese horror film Jun-on (The Grudge). What Ghost House does best however is promoting tourism in Thailand by showing us some of the local culture in both the good and naughty. Beautiful scenery in both the city and countryside to local temples, the creative team could not have picked better locations. 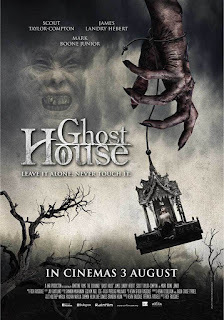 Ghost House failed to make ripples in the box office due to mediocre acting and wandering sub plots. Despite its limited budget it does a good job in providing some good scares. Mark Boone Junior (Sons of Anarchy) as Reno, a drifter that offers the couple advice is a waste of a known talent. Overall, if you're a fan of movies like The Grudge and Insidious watch it on Netflix if you have it. But it doesn't warrant a purchase on its own. 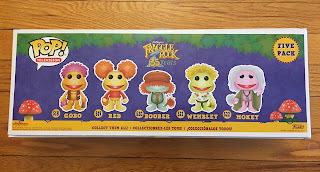 The official Funko Collectibles shop recently released this limited edition, Flocked Fraggle Rock 5 piece set. 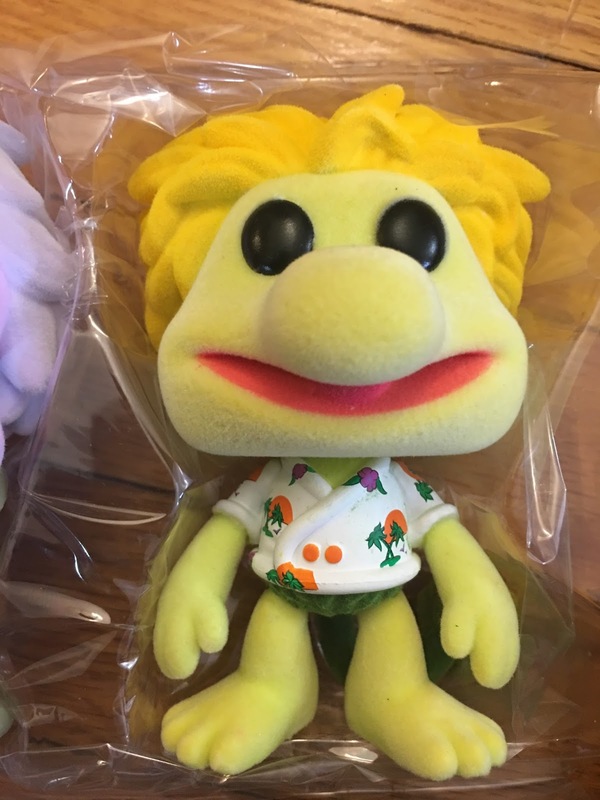 The set is limited to 3,000 with a retail price of $70.00. 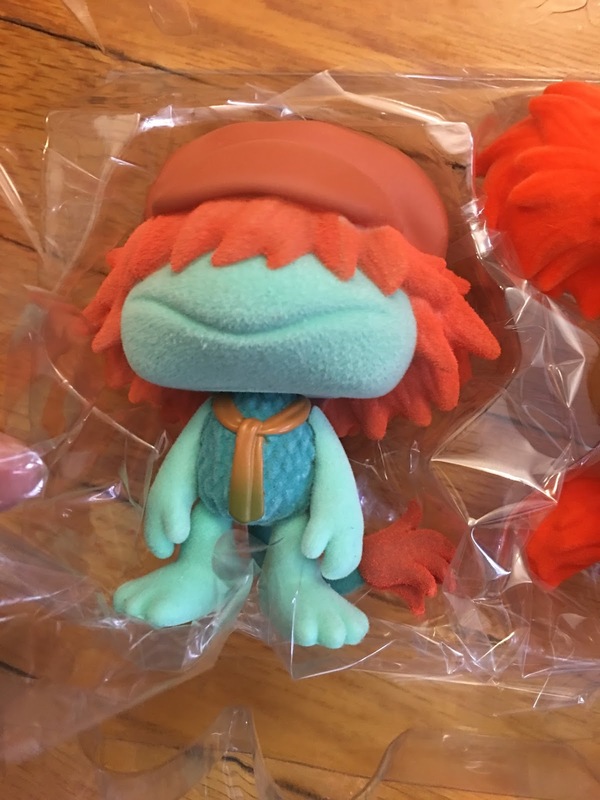 As of today, it is still available on their site here. Fraggle Rock if you are not familiar is one of Jim Henson's many creations. 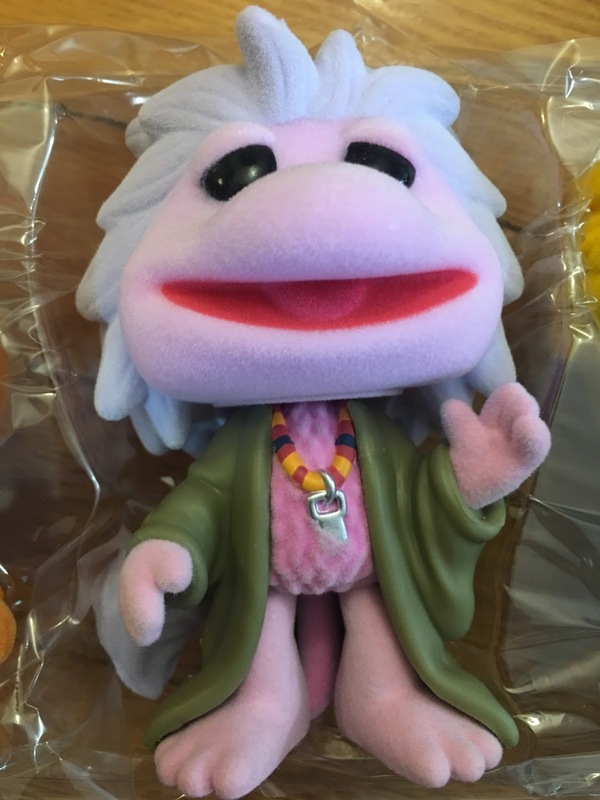 Begun in 1983, the show lasted for 5 seasons, had its own short lived animated Saturday morning series and even made an appearance in Jim Henson's other favorite vehicle, A Muppet Family Christmas. 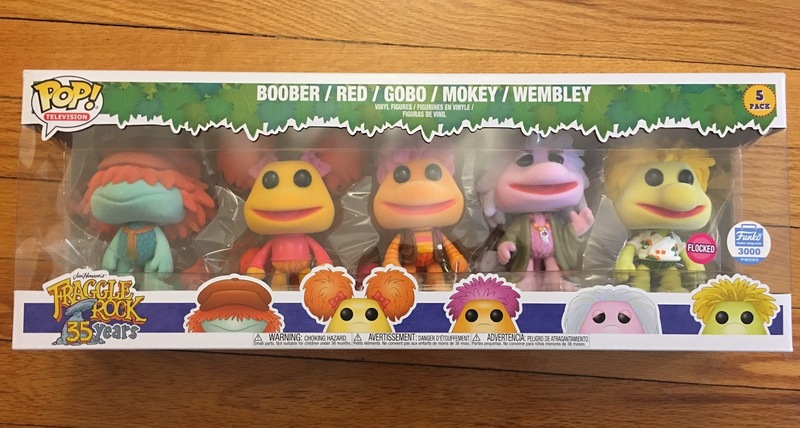 In this pop set which includes the major characters of the show in its flocked form (regular form are available in individual packaging). First the packaging... The set arrived double box which is good given the rather weak boxes that they use, and the fact that the boxes fit so snugged within each other. While it is easy to imagine how badly damage it could have arrived, thankfully it did not. When opening up the top of the inner box, be careful when cutting the top slit, as there is no protective paper to keep you from cutting the top box. 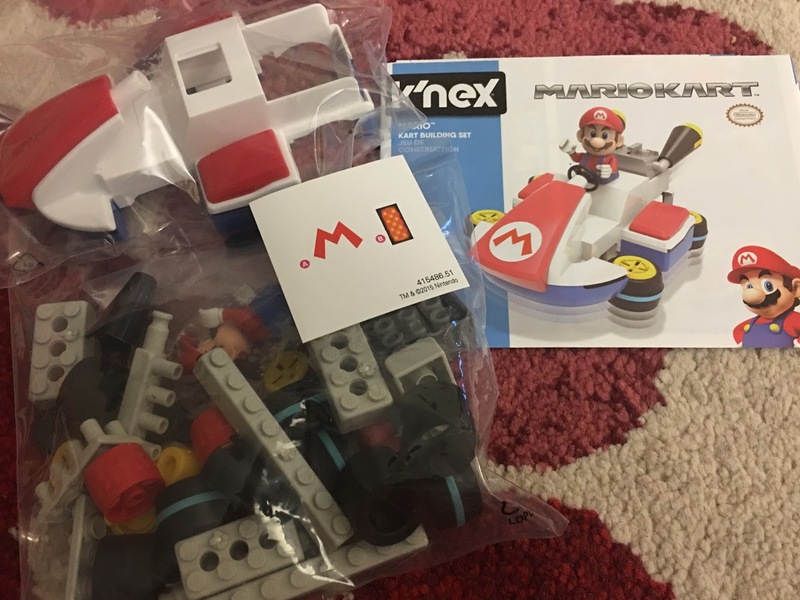 There are two small plastic clear stickers supposedly to keep the actual box inside closed, but they were loose on both the top and bottom. As far as the actual figures themselves, the quality of the fur from the flocked part is spot on with high quality in at least the set that I received. The mixture of the the plastic pieces of clothing and accessories with the flocked parts of the body are very well done. I just love the look of these! 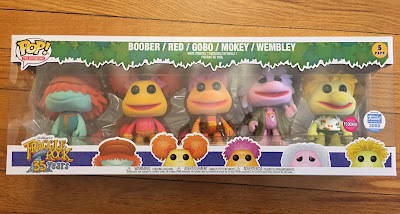 Overall, if you're a fan of Fraggle Rock I would highly recommend getting this set. The retail price of $70 seems a bit high. Usually the average price a single flocked pop is about $15.00 so in that comparison $70 is. Also add on about $10 for shipping and taxes, and you are looking at $80 for this set. 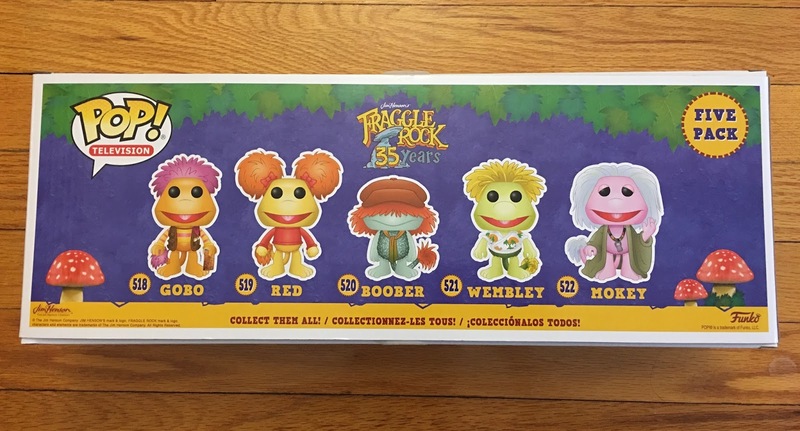 Because of these factors and that Fraggle Rock has a very limited (albeit loyal) fan base, it is no wonder the set hasn't sold out despite being limited to only 3,000 pieces. For those looking for a collection piece to accumulate in value over the years, you may want to look elsewhere. 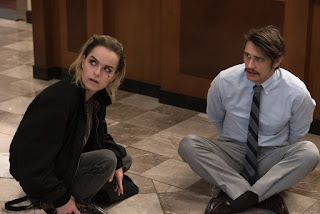 By Stephen M and Cynthia M.
I'm so excited for what's coming to COMET TV in January! Laybrinth! Probably one of my all time favorite sci-fi/fantasy films in the 1980s. Yes, there are a lot of good ones! See below for all the great stuff coming to COMET TV which is free if you have never check them out. Teen movies might want you to believe that high school was all about keggers and beautiful cheerleaders, but we prefer The Craft’s version of events. Featuring a quartet of angsty teens who turn to witchcraft in the face of personal high school horrors, The Craft casts a spell that leaves you wishing you had an occult stor on your local main street. January will mark the second anniversary of the day we lost pop culture legend David Bowie, so this month’s COMET is honoring his memory in the best way we could think of .... by screening one of the most iconic roles of his career. 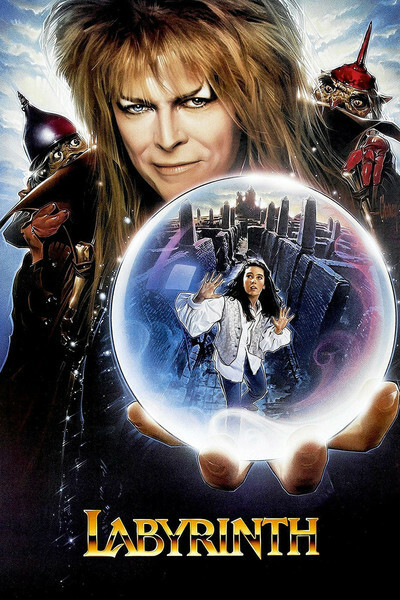 Back in 1986, Bowie stole the show as the Goblin King in Jim Henson’s Labyrinth, from the music to the costumes, this was Bowie at his best. Could there be a better way to shake off the post-holiday blues than with the adventures of Elvis in all his hip shaking and breaking glory? Of course not, which is exactly why you should be tuning in to watch Bubba Ho-Tep on COMET this January. Need to warm up on the cold Winter Wednesdays? Look no further than COMET’s brand new 2-hour block of Edgar Allan Poe programming. Each Wednesday evening at 6P/5C, catch the Tomahawk Man’s most beloved creations, including The Raven and Tales of Terror. Classic Space Opera is coming to COMET! Based on materials from sci-fi legend Gene Roddenberry, Andromeda stars all action hero Kevin Sorbo as the Captain of the Andromeda Ascendant, a highly advanced ship whose crew is charged with restoring power and stability to the Systems Commonwealth. But, to succeed the Andromeda crew must battle one of sci-fi’s weirdest looking bad guys….the sinister Magog! Review by Stephen M. and Cynthia M.
Animal Crossing: Pocket Camp which has been out for several months now both on iOS and Android is your perfect fix for Animal Crossing on a mobile platform. From fishing to getting new outfits and planting plants (from the latest update a week ago), there's that familiarity you have come to know from prior Animal Crossing games. The game is free to play, considered a socializing game, like The Sims but cuter. You do have options to purchase "Leaf Tickets" with real cash to help boost your play by allowing you finish tasks quicker and buy certain items. The chances you would ever really need to use reach cash is extremely low especially if you have a large network of random friends (strangers) to help you. While there is a great many repetitiveness to the game, it is surprisingly addictive as you must get the latest items including UGGS! Of course if your idea of fun is not pleasing everyone else daily than this game will be a complete turnoff for you. If it is, the developers are constantly on top with different events and updates adding new game play to try to keep it fresh. Unfortunately, Nintendo would not take my idea of adding a Grand Theft Auto like option to attacking the animal neighbors. Keep track of the movements of the neighbors and in your campsite to maximize the gifts and rewards you get in return for tasks and talking to them. The Quarry's prizes changes a few times a day. Wait for resources that you need and don't be afraid to use Leaf Tickets you may have accumulated!